I’ve been a fan of the Electric Light Orchestra for decades. I don’t think I am missing any of their recordings, aside from one or two obscure or rare tracks. I find ELO is the music I turn to when I need a boost, or want to relax for a while. I also love a good—or bad, actually—singalong when I’m on my own. The last album, Zoom, was released over a decade ago. Jeff Lynne had managed to bring some of the old band members together for the recording. I felt it was Jeff’s swan song, a last fling, going out in a high. Last year, though, Jeff was persuaded to come out of retirement and front a tribute to ELO in Hyde Park. It was a fabulous celebration of his music, and I think he was genuinely surprised at the overwhelmingly positive reaction to it. There are, it seems, still an awful lot of ELO fans out there. So it was with a great deal of pleasure that I discovered Jeff has been producing a new ELO album. You can hear a preview track on the American NPR web site. The new album, Alone In The Universe, is due out in November. I can’t wait. While the records are branded as ELO, it isn’t the old band. Sadly, we have lost one or two of the original members, but as the ELO sound was really Jeff’s baby, I think we can still think of the new tracks as “proper” ELO. It really does sound like classic late Seventies ELO to me, and that warms the cockles of my heart. Today, 7 September 2013, is apparently Cassette Store Day. Six decades ago, Philips revealed the Compact Cassette to the world at the Berlin Radio Show. Folk who really ought to know better (and some weren’t even born when I was playing with compact cassettes in the 1970s and 1980s!) think we should be celebrating this fact, and have persuaded numerous musicians and bands to release their music on this supposedly defunct medium. It took a while for the format to become mainstream. Early cassette tapes were of mediocre quality, but as the technology improved so did the sound quality. As a youngster, I fell in love with recording tape—my parents owned an ancient reel-to-reel recorder that I played with for hours, even learning to edit tape with sharp things and sticky tape. My sister and I would make rude noises, create silly sound effects and play about with the speed controls. It was a hoot, and I still fondly remember such antics. As I began to earn a disposable income, I began to buy records, and eventually I acquired a reasonable quality cassette recorder so I could still listen to them in my car. I always wanted to be a radio DJ when I was younger. I’d still jump at the chance if it came my way today, if I’m honest. While I waited, as a callow and spotty teen, for my big break into wireless, I created my own radio show which I lent out to friends. I bought a second-hand Akai 4000DS MkII reel-to-reel recorder (YouTube link to a young fan demonstrating his 40-year-old machine), and a second stereo cassette recorder. I learned to multitrack using the “bounce” technique, where you played back one tape and recorded it on a second machine with a second soundtrack. It was all very basic and limited, but I had a ton of fun. Eventually it spawned the Ticky Radio Show. 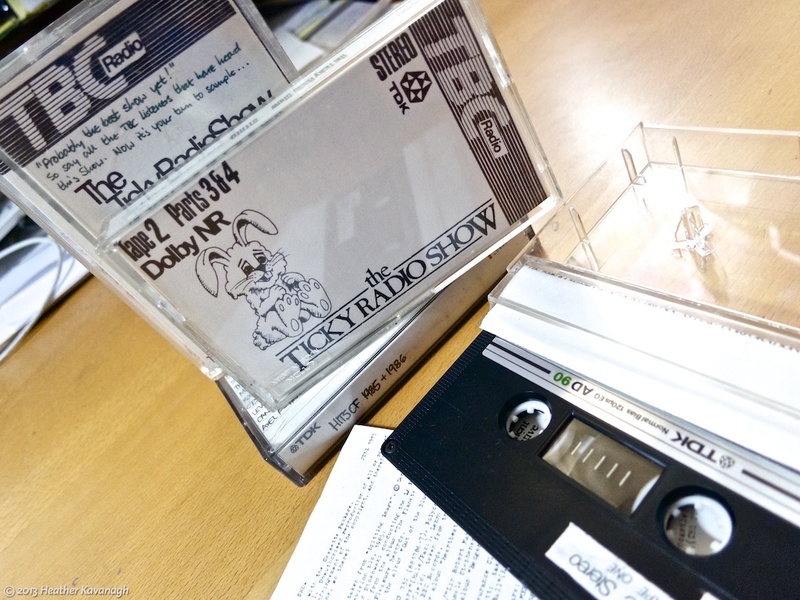 The Ticky Radio Show was a three-hour über mix tape, consisting of home-made jingles, favourite tracks from my collection, interspersed with snatches of comedy recordings. It was very much a shallow copy of my hero, the sadly missed Kenny Everett. The show was lovingly crafted, with musical selections to educate and entertain—many tracks were “flip sides” of hit singles, if I recall—and presented in two 90-minute cassettes with custom inserts designed by yours truly. Also included was a comprehensive track listing, carefully outlining the artistes, record label, recording number and so on. Originally, the TRS was in mono only, a legacy of the technology available to me. Then came a breakthrough: I could produce everything and record the show throughout in stereo! Sadly, this high-tech marvel was the last show I ever made, dating from 1985. I do still have those final recorded tapes (and one of the much-chopped-about seven-inch reels somewhere) of the last two shows I made. Having recovered them from their dusty storage to take their photo for Cassette Store Day, they will be rewound to the start of side A, returned carefully tape side down to the plastic case, and put back in the drawer once more. I do not wish to listen to them, as my rose-tinted memories of the hours spent in my home-made studio making the things will be much better than the real thing. Oddly, I didn’t buy much music on cassette. I preferred the LP until quite late in the 1980s. Eventually I bought a CD player, and began to buy new copies of my existing record collection, as well as add new material. I still made copies on cassette, simply because my car had a cassette player. I was one of those people who invested in the MiniDisc, too, and it was quite a while before I was persuaded that an MP3 player was a worthy replacement. Making mix-discs from CD to MD was a fun exercise, especially with a proper stereo mixer and a pair of CD players, but I digress. I still buy the occasional CD, but most purchases nowadays are a click away on the internet. The pleasure of selecting music, carefully timing everything to fit into the 46 minutes available, and then painstakingly writing out the playlist on the insert, is something I will fondly remember for many years. The utterly linear process would be completely alien to many today. Having to sit through a track as it’s recorded, and repeating that process to fill a whole tape, must seem such a strange thing to do. Everything is so instant these days, the concept of having to wait while something is recorded in real time seems so very old-fashioned. I wouldn’t want to go back there, though. I’ve been there, still got my record collection, and some mix tapes to prove it. I just wish I could have had the technology I have today back when I was a teenager lovingly making those “radio shows” in my bedroom. My love of audio recording is still there. I am currently considering acquiring a digital audio recorder to match with the DSLR for location sound. While I could use my MiniDisc recorder for such a purpose, I have grown to dislike having to replay the sound back in real time to get it into another digital form. If my 17-year-old self could hear me now!